It seems like we Richmondites living south of the City Hall are second class citizens. Until TODAY, the side streets are still a mess … it is passable but we still have our four lane street relegated to a single lane. Despite the warmer air the past two days, the hard packed snow is not really melting at all. Anyway, we ventured out again for lunch. We wanted to go to Top Shanghai but it was absolutely packed. So, instead, we pop over the new place next door. It’s called Tri-ty Cafe … odd name but it looked good. 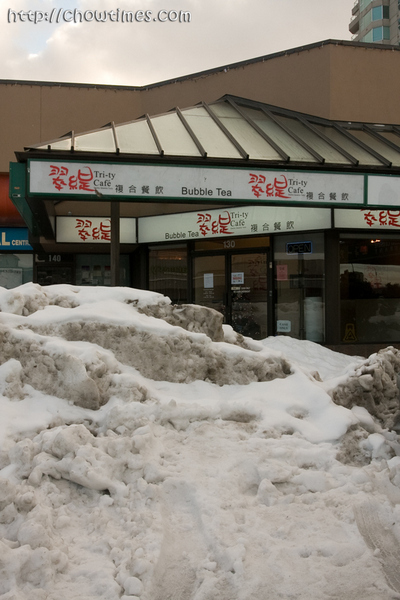 Tri-ty is located on the strip mall on Akroyd and No 3 Road. It’s on the side where Safe-On-Food is. Parking was madness that day because of all the snow piles taking up a lot of the parking bays. To add to the madness, everyone is taking the advantage of the break in the weather to venture out. You know the reason behind the Tri-ty name. Well, it is QualiTY, QuantiTY and TasTY! Actually, Tri-Ty is a hip place that caters mainly for the younger crowd. The decor has really clean lines but not spotlessly clean. It seems like a great place to hang out for youngsters because they pasted a cheap looking sign that says something like you gotta spend a minimum of $3 to hangout here … something like that. I thought that the sign kind of cheapens the place! 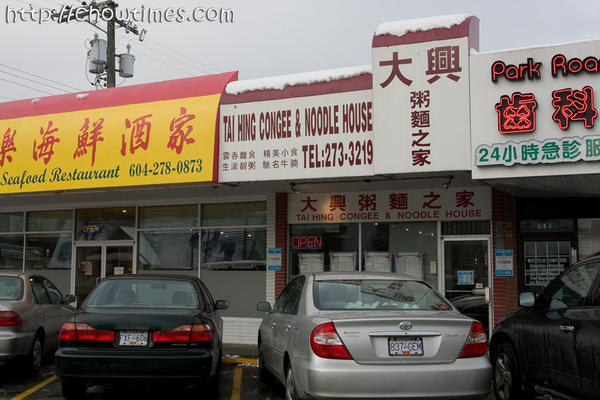 From the looks of it, this seems like a Taiwanese style restaurant. What I like about this place is that a lot of thought outside-the-box in placed on the little details. 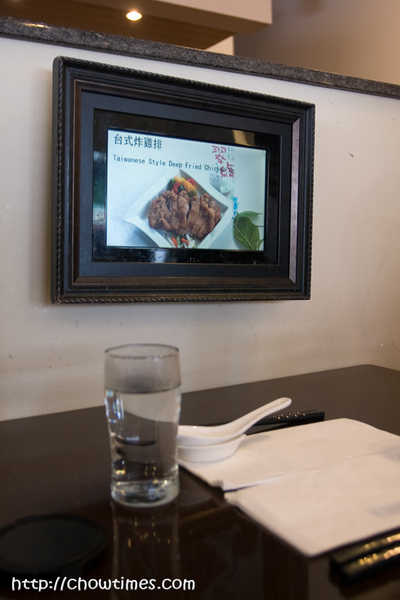 They even have one of those fadish electronic picture frames which flashes the delicious looking food and drinks. I think it is an awesome idea. We couldn’t help but kept on looking for what is shown next. I bet this draws a few extra orders … it is like a more modern version of “would you like fries with that?”. I have seen chopstick stands quite commonly but the one above beats the rest. 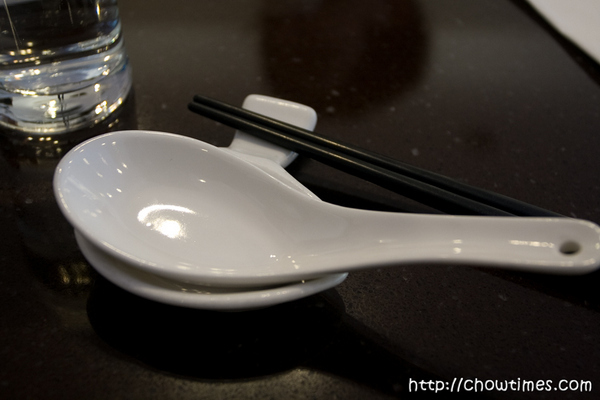 It is both a soup spoon and a chopstick stand. Pretty neat. I wonder where I could find one of these. It snowed the night before. It was one of those mornings, you know. The air was chilly and we all wanted more than just cereals for breakfast. We wanted something warm, hot and I could see Suanne hinting under her breath that she wanted to not make breakfast that morning. She does it ever so subtly … like commenting there are not enough eggs for everyone and that we are down to only two Costco croissants. LOL! The boys were too lazy to go out and so was I. The main problem was not so much as the drive and all … it is because we gotta brush our teeth, take a bath and put on going-out clothes. That is Suanne’s rules. It is like a formal event or something. Before we go out, Suanne will insist we all must, at the minimum, take a bath, brush our teeth, comb our hair and put on street cloths. This time she compromised … she allowed us to go out “as is” as long as she does not have to make breakfast. Deal … we said! So we all gingerly rescued our yesterdays clothing from the laundry basket and pull it over our head (after taking a quick whiff it is humanly acceptable). We quickly combed our hair using our fingers and made sure we zipped our mouth unless absolutely necessary during the short drive. Suanne, being the ever so prim and proper, went through the rituals. She kept very quiet during the drive because I can see that she was beginning to turn blue from holding her breadth. It was not that bad, really … and it’s all in her mind, we told her. We assured mum that once we take our first bite, the smell will theoretically dissipate. 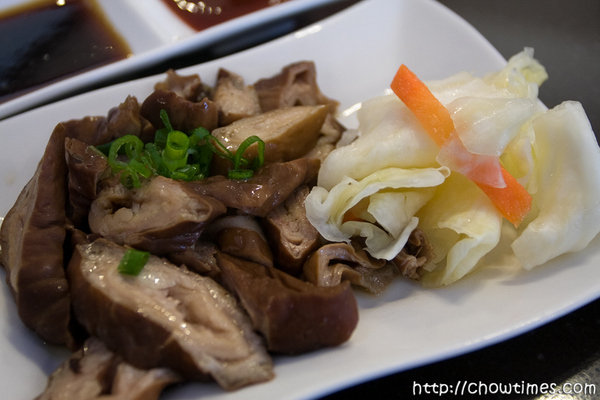 We knew about this place called Tai Hing. 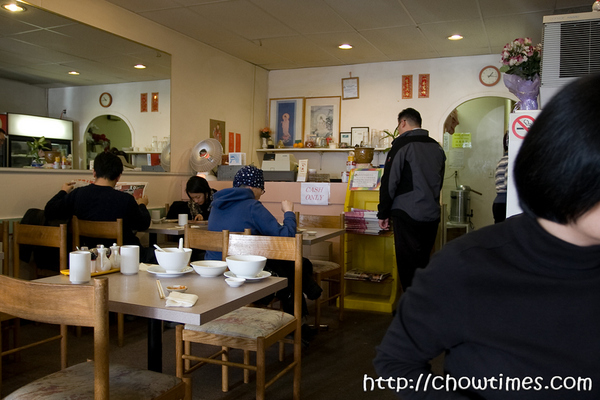 It is very well known for being cheap and no frills kind of a breakfast place. This is exactly the type of place where 73% of the people comes in without combing their hair. I brought the project team out for a Christmas lunch just before Christmas. The choice of the lunch places is somewhat limited as I have now a few contractors from India who wanted vegetarian dish. Moreover, I was told that they had been going to the Curry Express stall at the Metrotown Food Court for their daily fix of curry. So, I know they will then enjoy Saffron. 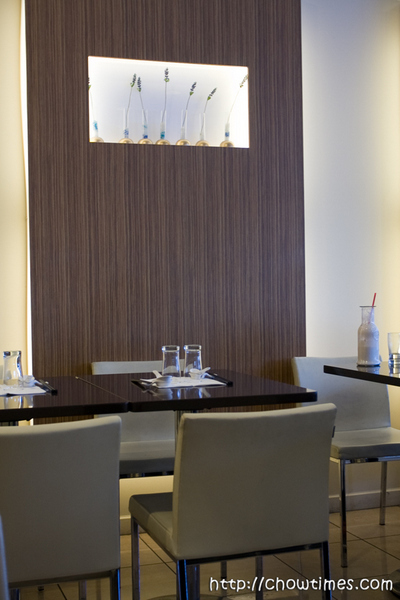 Saffron is located on 4300 Kingsway which is just walking distance away from the office. With all the snow still falling, no one was in the mood of driving anyway. 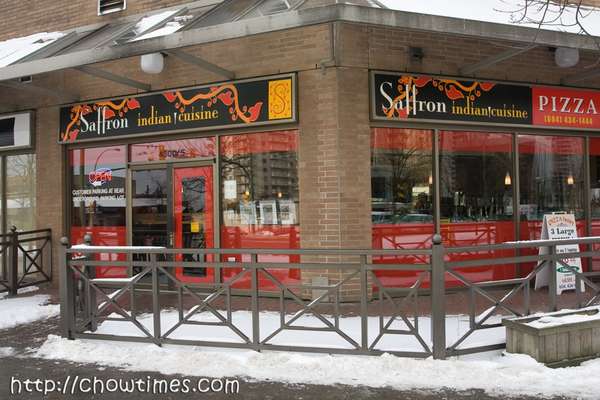 Despite the fancy name (Saffron Indian Cuisine), it is just a buffet place. 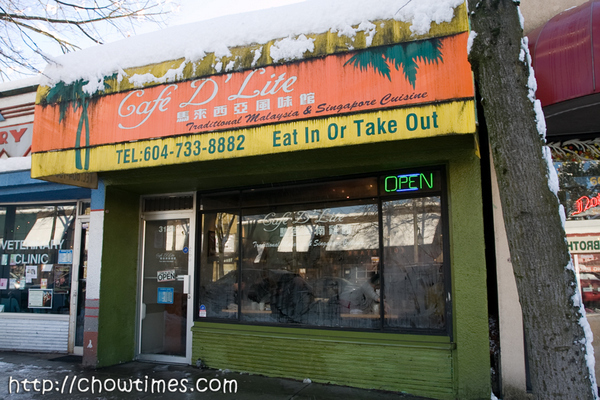 Updated: 23rd Dec 2014; This restaurant is likely closed as it’s no longer in Urbanspoon.com now. How was it? 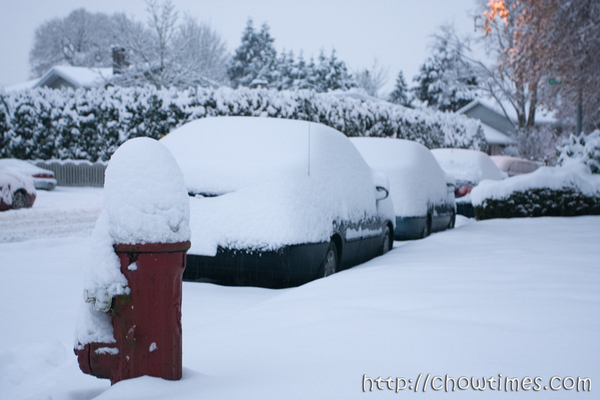 How did you like all the snow the past week? LOL! 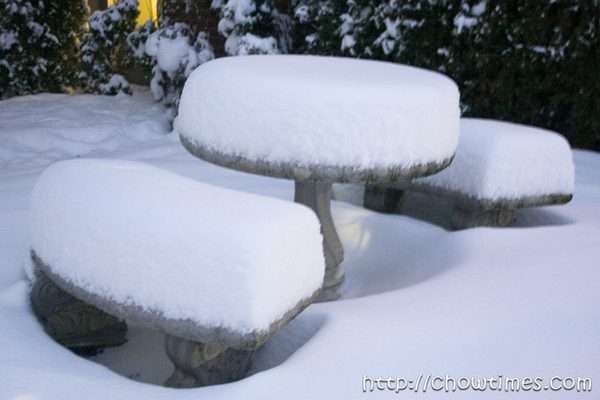 I’ve never seen so much snow falling in the Vancouver area for as along as I can remember. To think of it, it all came even before the official start of winter. Here in Richmond we had almost 2 feet of snow in all. Try walking in the snow and the snow will reach up to your knee. … you try to drive out to the streets. The city of Richmond did not bother to plow the side road until the day of Christmas which made it quite a challenge to get to the main streets. I think the worse is over now because yesterday many parts had turned into puddles of water. 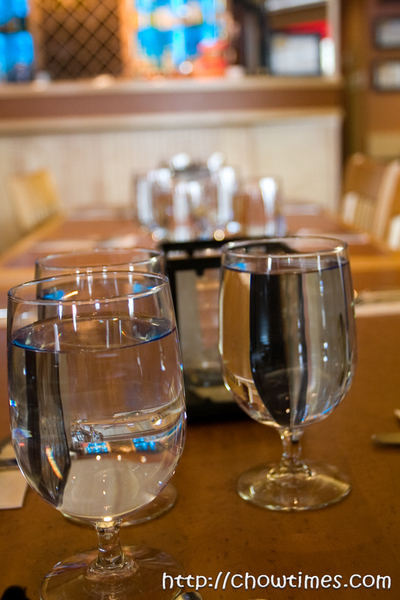 Suanne and I ventured out on an errand Vancouver downtown and ended up having lunch out. The last dish Minoo made for the seniors Christmas celebration is Canape. Canape is a finger food which often served during cocktail hours. Canape are usually salty or spicy. Traditionally, canape are build on stale while bread but for simplicity, we use baguette as the base and topped with a mixture of olives and nuts. 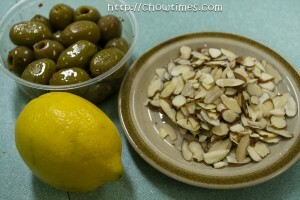 Minoo made two different flavours of canape, one with black olives and another with green olives. 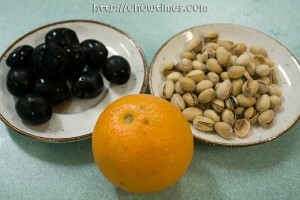 I prefer the one with black olives as it’s milder in taste. 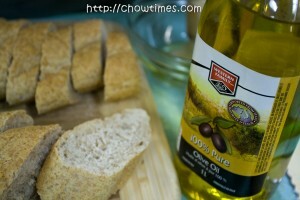 For those who love olives, the green one has a more intense olives flavour. Click on Read More for the instructions. Here is wishing you and yours a truly Merry Christmas and may your holiday be filled with the love, hope and joy. As you celebrate this occcassion with lots of gifts, my wish is that you remember the origin of giving of Christmas. Enjoy a little Christmasy message here. This is one of none Danish dish which the seniors made for the Christmas celebration. 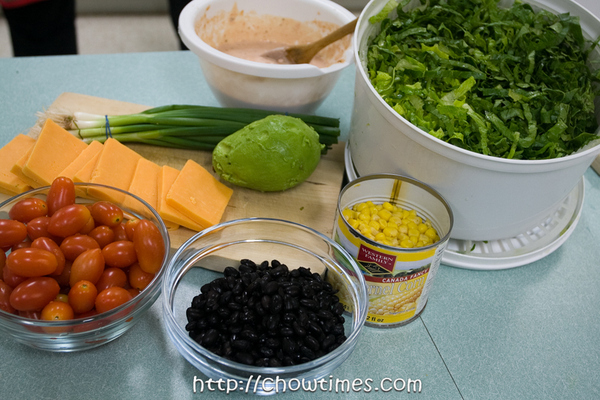 It’s called Tex-Mex Bean Salad with Creamy Salad Dressing. It’s kind of Mexican. Christina and June were in-charged of making this salad. 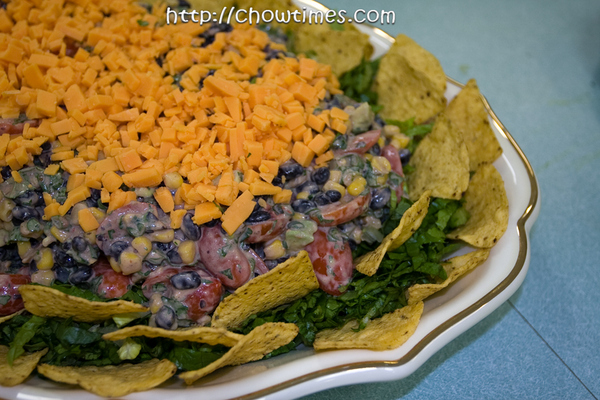 The Tex-Mex Bean Salad is great for potluck but it is advisable to assemble the salad just before serving. This is especially so for the tortilla chips so that they wont get soggy by the salad dressing. To store the leftover half of the avocado, sprinkle the cut flesh with lemon or lime juice or white vinegar. 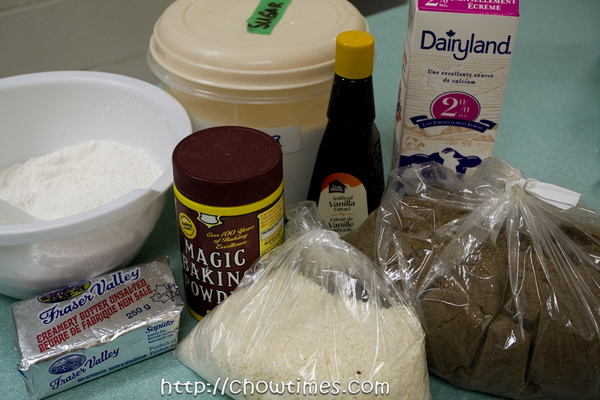 Place it in an airtight container and refrigerate up to 2 days. For dessert, Charlene, Frank and Karen made this Danish Brovst Dream Coffee Cake. As it was Minoo’s birthday, this cake also serves as her birthday cake. 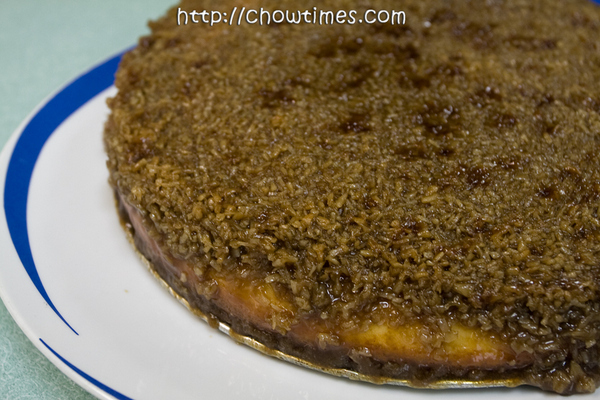 This cake has a topping of baked coconut flakes which resembles little ant and hence this cake is also known as “ant cake”. This cake is dense and sweet. 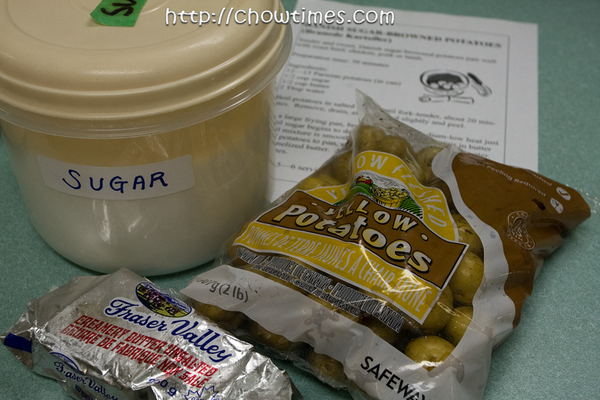 Minoo made this Danish Sugar-browned Potatoes specially for Paul. Paul described this potato dish to Minoo and Minoo was able to get the recipe from a Danish in a grocery store she visited. When Minoo tried the recipe at home, she ate all the potatoes by herself because they are that good. 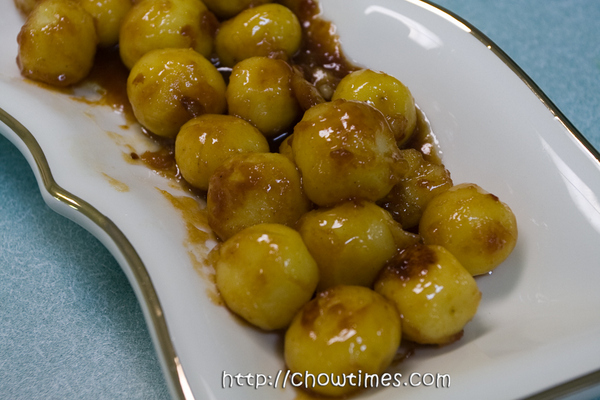 The Danish Sugar-browned Potatoes are tender and sweet. They pair well with roast beef, chicken, pork or lamb. Anyone Care for Costco’s Ribeye Roast … $2,299.99? Check this out. Costco is selling Japanese Wagyu Beef for a very special price … $2,299.99!!! You got to hurry before they are all sold out and do it early too to take advantage of their free shipping. Let’s do some math here, shall we? So, an 8 oz piece works out to be $76.66 before tax. Come to think of it, it is not that expensive after all. I am sure Costco is targeting this product to high-end restaurants. You know, Suanne and I might be willing to spend that kind of money ($76.66, not $2,299.99!) but the dilemma would be how to grill it to perfection. For that kind of money it better be perfect. How many of you had tried Kobe or Wagyu Beef before? Care to share with us your experience … i.e. where, how much, was it worth the money, etc?